We offer a full landscaping service in Oxfordshire, Warwickshire, Northampstonshire and Buckinghamshire. Our teams work to the highest possible standards and are used to working with the fine level of detail achieved through direct communication between in-house garden design team and landscapers. Many of the techniques we use we have refined over years of practice. We continually adapt our construction processes in the service of our principles which are: elegance in detailing, longevity and functionality. Doug Holloway Garden Design has a team of dedicated landscapers led by foreman Steve Ratcliff, to see jobs through from the design stage to planting and completion. Steve worked in London for 8 years as a landscaper and then as a site foreman, and then moved to Oxfordshire 4 years ago when he began working with Doug Holloway. Wood – As well as offering everyday landscaping items like fences and gates, we also make bespoke hardwood furniture, sheds, hardwood decks, bridges, and pergolas. We work in air dried wood and also in green oak. Stone – We build stone terraces, traditional and contemporary stone walling, furniture and sculptures. We are experienced in renovating old stone walls including re-pointing and lime mortar work. Water – We create detailed water features of any size. We make wild ponds and wild streams which include varied habitats for wildlife. We often design architectural water features to reflect light and create a sense of stillness in a garden. Although no artificial water body can be natural, we can design ponds and water features to both appear and function naturally. We believe that it is a good understanding of natural processes that enable the designer to create a practical pond or water feature whether it is contemporary and minimal or wild and abundant. We consider it vital that the relationship between the aquatic plants and the hard surfaces in a pond are carefully designed to take into account the fast development and aggressive nature of these plants, this is in order to ensure long lasting functionality. Metal – We commission, railings, gates, fencing, seating and sculptures in metal which we design in detail in house. Training Plants – We create wire systems on houses, fences and out buildings to encourage plants to become green walls, or shelter various parts of a garden. We have a number or different systems which we utilise from simple and cost effective nylon wire systems, to detailed stainless steel elements which have their own intrinsic beauty. 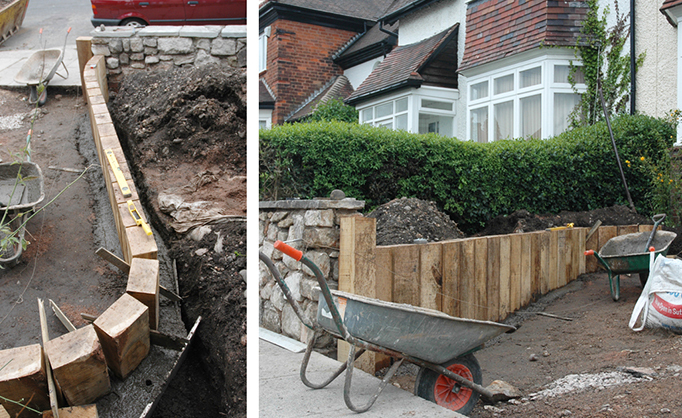 Mature Tree Planting – We have experience removing and planting large trees, hedges and shrubs. We are capable of sourcing, supplying, and planting semi mature trees. We can also use hidden ground tie systems so their is no visible tree stake above ground. We have experience in sourcing mature instant hedging, and traditional bare root native hedging. Landscaping that Lasts – We know that gardens continue to grow in character as the years pass by, and we recognise that it is essential that our landscapes are built to be durable for many years into the future. We have a skilled team of landscape gardeners with up to 10 years of experience in the industry and a large list of subcontractors and associates we can draw on for specialist skills.